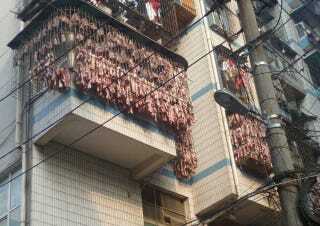 You Don't Want To Live Next to China's "Bacon Apartment"
Some people hang clothes on their balcony. This resident, it seems, hangs meat. Lots of it. Online in China, photos of what looks to be a butcher working out of an apartment have popped up online. If this resident is not a butcher, then he or she certainly has an interesting hobby. Large amounts of pork are being cured by draping them on the balcony and on the windows' burglar bars. Hope the air quality is good in Wuhan! Obviously, the photos are surprising many Chinese net users and are now circulating on the country's biggest news sites, such as iFeng. Chinese bacon (腊肉 or "la rou") is different from Western-style bacon. As website SeriousEats points out, Chinese bacon is made from pork belly and air-cured. Probably not usually on an apartment balcony.